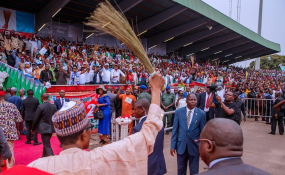 President Muhammadu Buhari at a campaign rally brandishing a broom to “sweep away corruption”. The elections are here again. On Saturday, February 16, 2019, Nigerians will choose whether to reelect President Muhammadu Buhari or to vote him out with their Permanent Voters Cards (PVCs). Indeed, for the next few weeks, Nigerians will go to the polls to elect not just the country's next president but senators, house of representative members, and state governors and states' houses of assembly members. Nigeria's elections have historically been tense, and as the day draws closer there are concerns the upcoming process will come with attendant health implications. Several studies have shown that the candidates and the voters are prone to psychological and mental disorders such as depression, heart or organ failure, high blood pressure, diabetes and chronic fatigue. Also, the impacts of voting and political decisions touch nearly every facet of daily life, from safety, to housing, to education, and health. The Guardian investigations revealed that politicians are increasingly prone to ill health this season, as the need to visit nearly every part of the country in furtherance of political campaigns puts enormous pressure on them; and sleep problems, headache and depression set in. Psychologists, who have tracked politicians' careers, say their mental health should be monitored. Nobody really believes that members of the executive arm of government are having mental health problems. Politicians do face high levels of responsibility and therefore stress. They send young people to war zones and determine the future finances of the country. Senior lecturer in psychology at the Salford University, United Kingdom, Dr. Ashley Weinberg, suggests politicians should be regularly screened to test their psychological health and ensure "they are in the best position to make decisions in the national interest." He said: "Decisions that mean people will lose their lives are very painful. They are bound to take a psychological toll, and it will be down to a politician's coping strategies as to how they deal with it." It is not just the politicians that are vulnerable. The work pressure, money worries or relationship troubles, most Nigerians experience daily come with dire consequences. Some of the better-known implications of stress that many Nigerians may have experienced include sleep deprivation, headache, anxiety and depression. But increasingly, researchers are uncovering more and more ways in which stress can harm the health. Several studies have shown that the election may be affecting health at much more individual level. Assistant professor of psychology & neuroscience at University of North Carolina at Chapel Hill (UNC), United States (U.S.), Dr. Keely Muscatell, studies how social experiences impact health. Her research supports the growing consensus that psychological stress can lead to physical inflammation, which has been implicated in numerous diseases. One recent study led by Muscatell explored how one episode of social rejection can cause otherwise healthy people to develop symptoms associated with chronic inflammation. In the study, Muscatell asked research participants a series of in-depth personal questions like: "what would you most like to change about yourself," and "tell me about a time where you really disappointed someone." These interviews were filmed and then played back to "confederates"--a psychological term for research assistants that pretend to be study participants (not 19th century Secessionists). The real participants, while inside a Magnetic Resonance Imaging (MRI) machine, then watched these confederates respond to their interview. Muscatell said: "So the person goes in the scanner and when they're in there they see this grid of adjectives. "Some of the adjectives are positive, some are neutral, and some are negative. And what they see during the scan is this little mouse cursor that moves around the screen and every ten to twelve seconds selects a different adjective. And so the cursor is supposedly controlled by the confederate and it's their 'real-time feedback' of what they're thinking." Muscatell, holding the grid of adjectives used in her research study to "rate" research participants. This allowed her team to see how people respond physically to emotional stress. The research found that when study participants received negative feedback--adjectives like arrogant, boring, and shallow - they felt socially rejected. But it goes much further. The participants who were particularly reactive to the negative feedback got more than just a sore ego. Their bodies actually had a physical response to the video as if they had suffered a physical injury like a cut. In the paper, Muscatell and her team showed that participants actually started exhibiting symptoms of inflammation in response to the negative feedback. Specifically, they found elevated levels of pro-inflammatory cytokines. Muscatell said: "Pro-inflammatory cytokines are basically these proteins that are secreted by immune cells that are the body's first line of defense against injury or infection. So if you get a paper-cut and the area around it swells and turns red, that's because of these proteins. "What we've learned in the past few decades is that these inflammatory processes can be elicited even in the absence of any physical injury or infection. Purely threats to our social standing or our social esteem can elicit these changes in inflammation." Muscatell's study, which was published in Brain, Behavior, and Immunity, was further support for this connection between social stress and inflammation. Her paper showed that just this one negative experience was even altering gene expression to produce more proteins associated with inflammation. The implications for this are huge, because inflammation plays a critical role in many deadly diseases. Muscatell said: "The things that people tend to die from nowadays--especially things like cardiovascular disease, some cancers--have all been linked to inflammation. "So the whole mantra of 'sticks and stones may break my bones but words will never hurt me'-- I think my research would say that that is actually not true at all." But what does this have to do with the election? Well, if the election is leading to increased stress and anxiety there could be very real consequences for public health. Nigerian presidents have experienced common health problems. Many of the leaders attempted to hide their ailing health from the public, making health both a medical and a political issue. It is believed that during elections anyone can develop the diseases and illnesses prevalent in the society, from obesity to heart disease, depression to anxiety, and more. Indeed, the health of political office holders is a matter of great interest to Nigerians after the passing away of a sitting president in 2010. President Umaru Yar'Adua's reported death from an ill health that existed before he ran for office caused a political crisis. The then presidential candidate of the Nigeria's opposition party, the All Progressives Congress (APC), Gen. Muhammadu Buhari (rtd), was alleged to have collapsed during a political campaign due to ill health. President Buhari has in the last four years being going to the United Kingdom (UK) to receive special medical attention. But the truth is that Buhari and Atiku Abubakar as well as other politicians and most Nigerians are 'sick' from stress. A public health physician, Prof. Akin Osibogun, told The Guardian: "Stress is significantly associated with virtually all the major areas of diseases. Stress is seldom the root cause of disease, but rather interacts with our genetics and our state of our bodies in ways that accelerate disease." In fact, it is estimated that over 75 per cent of Nigerians report experiencing moderate to high levels of stress over the past month. However, contrary to the common wisdom that people in positions of power are more stressed than the rest of us, a new study finds that those in higher-ranking roles wield more control and, thus, suffer less stress and anxiety. While the image of the stressed-out executive or the politician under pressure has been firmly planted in the Nigerian mind, research increasingly suggests that it is actually people lower down on the social scale- not those in leadership positions at the top- who suffer the worst health effects of stress. A new study of military officials and government staffers at a Harvard executive-training programme, published by TIME magazine, confirms these findings, showing that as people climb the organisational rungs, their stress hormone levels and anxiety typically go down. The issue of the President of the United States of America, Donald Trump subjecting himself for medical evaluation has generated concern on the need for presidential candidates and other public office holder in Nigeria to undergo medical check up to ensure they are fit for the job. The news of Trump's annual medical examination on Friday, February 8, 2019, flooded the media and internet, while adhering to his doctor's (then chief physician, Ronny Jackson) advice on increasing his exercise and cutting calories a year after it was discovered his cholesterol levels were high and his weight (108kg), showing sign of obesity. The American president, 72, who delights in confounding health experts with his junk food cravings and disinclination to exercise, underwent an annual medical check up at Walter Reed National Military Medical Center, Washington, where he spend more than four hours for his examination, which was supervised by his physician, Dr. Sean P. Conley, also involving a panel of 11 specialists. Colony went further to announce to the public that the president is in very good health, confirming Trump's capacity to remain for the duration of his presidency and beyond, including vying for another tenure. However, medical experts in Nigeria have posited that if modern-day presidents have undergone regular medical exams, not only to catch any potential problems, but also to assure the public that they are fit for office, something Trump's doctor last year took to an extraordinary level, then all public office holders and those vying for the positions should also so same and see it as a prerequisite. Medical experts are unanimous that candidates for elections, including Presidential candidates, should have mandatory medical evaluation by an independent team of experts led by the Surgeon-General of Nigeria. Former President of the Nigerian Medical Association (NMA) and Vice President, Commonwealth Medical Association (CMA), Dr. Osahon Enabulele, told The Guardian: "Indeed, the possession by candidates of a Medical Certificate of fitness before elections and yearly thereafter, should be a mandatory constitutional requirement for candidates seeking election to political and public offices. Doing so, will be in the interest of the candidates, good and effective governance and the good health and prosperity of the citizens. "I have actually been a proponent of this position and so I still support it. As a Delegate to the 2014 National Conference, I presented a motion during the plenary... "
Current President, NMA, Francis Faduyile told The Guardian that being healthy does not imply absence of obvious health challenge. He noted: "There is no doubt that the demands of political leadership especially the office of the President of any Nation, requires that the holder of the office be in a sound state of health, and by implication whoever that aspires to occupy such office. "The school of thought that has been clamoring for this the world over premised their argument on the incidences of ill health that prevented occupiers of such offices from being able to discharge the attached duties and responsibilities and with deaths in some instances from conditions that were previously known. "It is a fact that certain health conditions may become aggravated by stress and exertion which may come with electioneering campaign and the demand of the office of the President. The public declaration of the state of health or the knowledge of it, will guide the electorate in making informed decision about the candidates especially in developed democracy. It is also considered as part of accountability process (as an intending high ranking public officer). On specific issues like mental health evaluation for aspiring political office holders, Faduyile said: "While the need to ensure sound in all its ramifications cannot be overemphasized, experts have expressed differing opinions. But more importantly, the body of Psychiatrists stated that it would amount to stigmatization of mental illness. "As laudable the ideology may seem it is pertinent to note that extant rules and law does not stipulate that an aspiring candidate for political office, President inclusive, must undergo thorough medical examination. Not even mandatory by law for the President of the country. Fundamental human right is also a key issue in term of disclosure of health status by the candidates. He, however, stressed that the submission of the President of America, Mr. Donald Trump, to medical examination, is worth emulating. " This certainly comes with public trust and will clear or affirm any form of doubt. Though this has been a common practice for presidential candidates and presidents in the USA, it must be mentioned that it appears more like a conventional issues and not binding by law," Faduyile added. Also, for the umpteenth time, the major political parties are promising among other things free medical care for babies and pregnant women. *Prioritise the reduction of the infant mortality rate by 2019 to three per cent; reduce maternal mortality by more than 70 per cent; reduce Human Immuno-deficiency Virus (HIV)/Acquired Immune Deficiency Syndrome (AIDS) infection rate by 50 per cent and other infectious diseases by 75 per cent; improve life expectancy by additional 10 years on average through our national healthy living programme. *Increase the number of physicians from 19 per 1000 population to 50 per 1000; increase national health expenditure per person per annum to about N50,000 (from less than N10,000 currently). *Increase the quality of all federal government owned hospitals to world class standard within five years. *Invest in cutting edge technology such as telemedicine in all major health centers in the country through active investment and partnership programs with the private sector. *Provide free antenatal care for pregnant women, free health care for babies and children up to school going age and for the aged and free treatment for those afflicted with infectious diseases such as tuberculosis and HIV/AIDS. *Boost the local manufacture of pharmaceuticals and make non adulterated drugs readily available. *Streamline the inefficient bureaucracy in health care delivery. Abuja; leveraging existing selected hospitals, infrastructure, human resources, and referral networks; and creating a regional medical hub for medical tourists. *Introducing strategies to stimulate the local production of vaccines, medical supplies and generic drugs to ensure a sustainable supply of essential, life-saving medicines. *Institutionalize health-screening programs for preventable diseases like cancer. *Develop targeted programs to improve maternal health, specifically in the areas of antenatal care, identification of high-risk pregnancy and provision of skilled birth attendants. *Encourage medium and large-scale pharmaceutical industries for the local production of essential drugs. ActionAid Nigeria (AAN) in its analysis of the 2019 presidential candidates' manifesto drew the attention of the political parties to some pertinent issues that may have negative implications on the lives of the citizens and may likely result in the non-realisation of the Sustainable Development Goals (SDGs). - Emergency preparedness; with communities across Nigeria still bearing the brunt of flooding and the number of internally displaced persons spiralling by the day. - Inclusion of Persons with Disabilities (PwDs): there are over 25 million PWDs in Nigeria, with little or no priority on service provision and inclusion of PWDs in governance. - Development and maintenance of quality database on the Nigerian population: lack of appropriate data has been the bane of implementation of government policies and specific government programmes over time. - Making technology affordable: while the policy documents aim to address the issue of accessibility, affordability remains a challenge for rural communities and the estimated 80 million Nigerians who live in poverty. - Dealing with security challenges outside the northeast; while plans to tackle the decade long insurgency in the northeast is commendable, there are other growing security challenges; religious, communal and secessionist clashes across the country that needs to be nipped in the bud before they escalate. 2. The development agenda of the PDP is hinged on privatisation. While AAN recognises that the economic conditions of the nation require drastic measures, with privatisation seeming as the best option, but considering that privatisation has not worked in the past, particularly in the power sector, it is pertinent to tread carefully. Privatisation rather than solve problems of corruption which has continued to undermine development in the country, has only, deepened poverty and continues to widen the gap between the rich and the poor. AAN is concerned that privatisation will further increase the margin between the rich and the poor because with privatization, public services will turn into a merchandise available only to the highest bidder. AAN believes public services should be publicly financed, publicly delivered, equitable and inclusive and of good quality in line with human rights framework. 3. The APC healthcare plan is focused on human resources. While AAN commends the plan to pay young doctors to work in rural communities, the effort may not yield much result without commensurate infrastructures, drugs, and other essential healthcare consumables. To achieve a sustainable healthcare for Nigeria's growing population, the duo of human resources and quality infrastructure is key. During the 2016 midterm elections campaign, the current US President who called for banning a religious minority from entering the US, the creation of a Muslim registry, the deportation of 11 million illegal immigrants, was found to have once boasted about sexually assaulting women, and called Mexicans entering the US criminals and rapists. Combined, these affronts against under-represented groups could be having a serious effect on the mental health of broad swaths of the US population. And, according to Muscatell's research, this has physical health consequences as well. "These are all slights that could be leading to these types of changes in physiological processes that we know are linked with chronic disease," Muscatell said. "And to the extent that that's happening over and over again, I think it really could lead to a potential uptick in chronic diseases, particularly among people who are marginalized and targeted by the negative rhetoric." So are minority groups actually sicker because of the election? Unfortunately, there's no comprehensive data yet. What we do know is that during the election the majority of Americans--including equal proportions of Republicans and Democrats--viewed the election as a significant source of stress. And after the election, 35 percent of people thought their stress levels were still elevated due to President Trump's election, including 54 percent of Hispanics. Importantly, just 12 percent of people felt their stress levels decreased after the election. All that stress may be contributing to a sicker population, particularly if it is leading people to feel socially and politically rejected--something not far out of the question considering hate crimes against minority groups are on the rise. But until we figure out for sure, Muscatell suggested that everyone consider how their words may be impacting the health of others. "One of the things that I hope my work does is lead people to have a reaction when they realise 'wow, these negative social experiences aren't just annoying'" she said. "These are experiences that are being processed by the brain and translated into changes in our body."